The Quick and Clean Diet promises weight loss by clean eating using delicious, natural recipes. Its arthor, Dari Alexander, is the main anchor for Fox 5 News in New York City. She also attended culinary school in New York and Paris where she learned how to create healthy and delicious recipes. In The Quick Clean Diet she shares her perfect plan for healthy eating and successful weight loss. The program focuses on the practice of “clean eating”, which involves consuming foods that are processed minimally, if at all. You should select foods as close as possible to their natural state. On this plan you will be avoiding all pre-packaged, refined and fast foods. This will allow your body to release toxins and stubborn fat. You will enjoy locally grown fruits and vegetables, lean proteins, low-glycemic carbohydrates and healthy fats. The first phase is designed to detox your system, stabilize blood sugar, eliminate cravings and jump-start weight loss. It is the most restrictive stage of the diet but it also offers great rewards and rapid results. This stage lasts for 14-days and provides between 1000-1100 calories a day. You can now enjoy a wider variety of foods as you continue to lose weight. You will notice that you now begin to crave the clean, whole foods that give you energy and mental clarity. This stage is continued until you achieve your ideal weight. This is where you learn how to eat to maintain weight loss and stay healthy for the rest of your life. At this stage in the diet you can start eating high-fiber grains such as oatmeal, quinoa and barley. Just remember to watch your portion sizes. Wine and alcohol is also permitted in moderation. Alexander has taken advantage of her training as a chef to create delicious meals for every stage of the diet. The recipes are simple and quick to prepare. The recipes include foods like: Free-range chicken, turkey, shrimp, salmon, pork, grass-fed beef, organic eggs, low-fat cheese, Greek yogurt, tofu, steel-cut oats, cannelini beans, almonds, pumpkin seeds, avocado, lettuce, spinach, mushrooms, bell peppers, green beans, asparagus, sweet potato, raspberries, strawberries, papaya, mangoes, pears, olive oil, flaxseed oil, stevia, green tea. The Quick & Clean Diet recommends physical activity primarily for its health benefits. Studies show that exercise releases chemicals in the brain that relieve stress and enhance your mood. Weight training performed on a regular basis can improve balance, coordination and prevent osteoporosis. If you don’t have a structured exercise regime, in the very least try to walk as often as you can. . 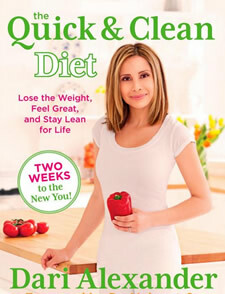 The Quick & Clean Diet: Lose the Weight, Feel Great, and Stay Lean for Life retails at $24.95. Encourages consumption of fresh, unprocessed foods. Includes a 14-day meal plan with recipes. Offers shopping strategies and advice for eating in restaurants. Includes guidelines for maintaining weight loss. Focuses on eating for lifelong health. Author is a trained chef. Endorsed by Dr. Mehmet Oz. Calories are very low for the first 14 days, which may result in hunger and fatigue. First phase is very strict and requires elimination of many foods including whole grains, bread, potatoes, pasta, rice, desserts and alcohol. Does not contain any particularly new or unique information. Dari Alexander is not a qualified health professional. The Quick & Clean Diet starts with a rapid weight loss plan based on the principles of “clean eating”. It offers a simple and practical introduction to clean eating that is suitable for busy lifestyles. Once the basic principles have been learned the program can be followed as a lifelong approach to healthy eating.